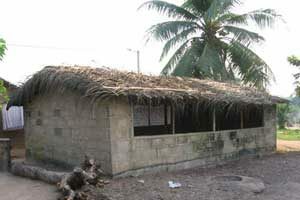 Barthe started by first finishing off the chicken coop he had started some years ago –adding chicken wire, cementing the floor, putting up laths for a black plastic roof held down by palm fronds, and adding a door. 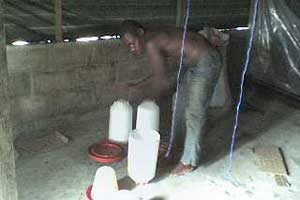 He also had feeders made and bought watering equipment and other equipment as needed. 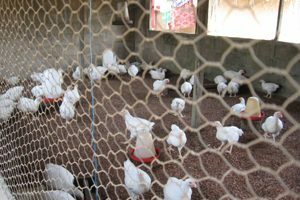 This chicken coop is right in Barthe’s courtyard, in the village of Touadji I, so it is easy for his family to keep an eye on things while he is out in his fields. 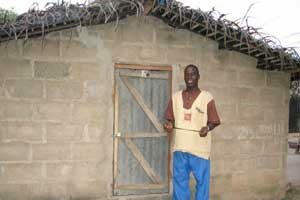 Barthe standing by the door to his chicken coop. “Abreuvoirs” in French, or “watering troughs” for the chicks. 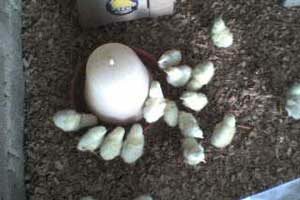 The day-old chicks arrive 50 to a box. Ready to sell! Notice the wood shavings gotten from a carpentry shop and used as bedding for the chickens. The wood shavings have to be changed every so often, or the smell becomes over powering! BARTHE’S STATUS: Barthe lost 116 of his 153 chickens in a matter of two days! He was on a trip and the person he left in-charge did not react fast enough with medications and a plague of diarrhea swept through the chicken coop. 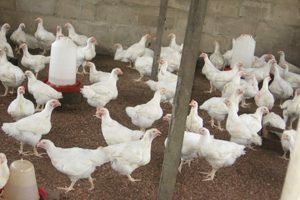 Barthe started up another batch of chickens (this time only 50). These he had to sell early at a less than optimal price because he did not have the money to feed them to maturity (a family member stole his savings). Currently Barthe is managing two phone booths and slowly paying back his loan. In August this year (2009) we will hold an evaluation seminar with the Bakwé microentrepreneurs, led by Dr. Kjell Christophersen.